Over the years many firearm manufacturers have considered making a firearm for women. Some decided the market is too small to justify the effort. Others have made halfhearted attempts, or even worse a gun with a shortened stock that has been painted a silly color. In our opinion these efforts are something less than genuine. Syren is a different story. As a division of Caesar Guerini and Fabarm, the goal of Syren is to provide products that are designed exclusively for Women. We want to finally end the need for making compromises. No more modifying existing products, no more paint to cover up an altered stock, no more youth models being pushed as your only option. Our shotguns and accessories are designed just for Women and led by Women. 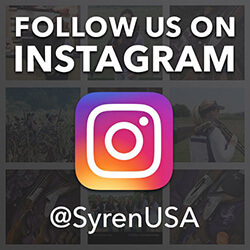 Everyone involved with Syren, from our female management team to our Pro-Staff ladies, are committed to producing the best products possible so that there will be no more compromises when it comes to our lady shooters and their needs.